ikat bag: ikatbag is 2! That's almost as old as Kate, and almost as zany! Almost. Two years of craft-blogging! Fun. Thank you all for making it another exciting year. I appreciate all my followers (there are almost 800 of you! Helloooooo! ), all my commentors, all my readers who share photos, stories, questions and requests, all my fellow bloggers who send me awards, who link and link and link and who regularly feature me on their sites, all my buyers-of-patterns and etsy store customers and all you other wonderful people out there who say things like, "because of you, I decided not to donate my sewing machine to Goodwill" (sorry, Goodwill) and "yesterday I made shorts for the first time from your tutorial and didn't drink vodka during". I am going to celebrate by not sewing today and going to the park. We've all been sick with coughs and general crabbiness the whole past week so today is the first day I feel as if I can go out with the kids without fainting. So to the park/pond we go, armed with a bag of stale bread with which to nourish the fish and other aquatic denizens therein! and I'll pick the first right answer or the one that's closest, whichever is first. If you want to make a second guess when some new idea hit you later in the day, go right ahead and leave a second (or third) comment. I'll moderate and publish your comments as they come in. This photo will be your only clue, and tomorrow sometime I will close the giveaway and tell you what it is. Anyone in the world with a valid email address can enter. The winner will get the pdf pattern to make this weird thing (if they want it, I mean - they can always shriek and say, "ugg, no thank you, I've changed my mind" of course). Unrelated and yet not: thanks for the interest in the free bibs. I apologize if that post was misleading in making you all leave comments with email addresses etc as if that were the giveaway post. It wasn't. Sorry about that. I just took some pictures this morning and sorted out which of the bib pieces are in girl and boy fabrics and counted them up. Either today or tomorrow I will do a proper giveaway post with deadlines and instructions on letting me know whether you want girl or boy bibs and who can enter. So quite a few gifts for you this week! Again, thank you all for reading along with me this year (and the last)! Happy Birthday I-Kat Bag. 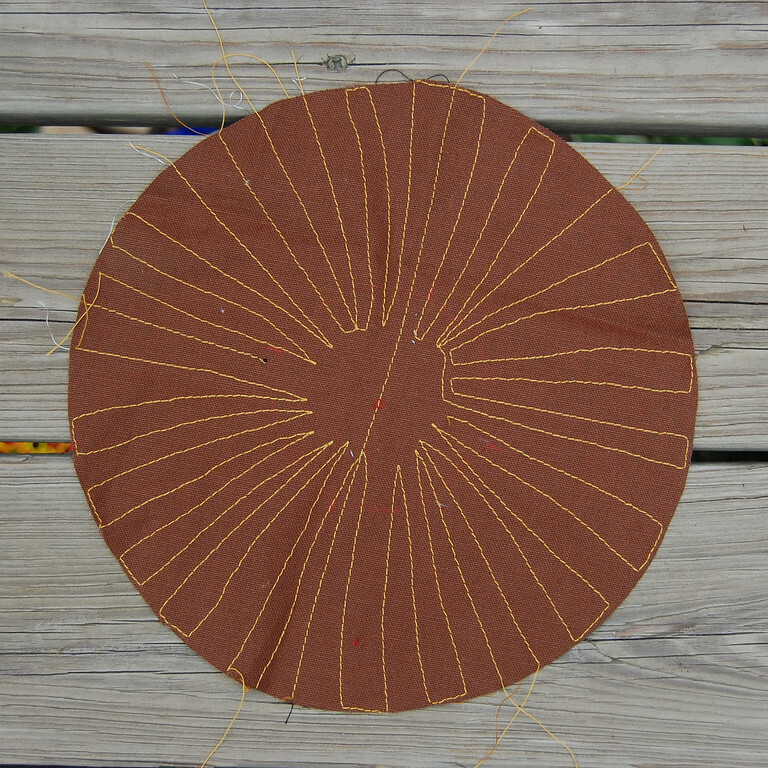 I think the odd brown circle reminds me of the underside of a mushroom/toadstool. So that has to be my answer for what it is. congratulations on your anniversary/birthday/two years! this is one of my favorite sewing blogs, and i'm constantly telling my husband about the cool things that you make. I'm guessing that its a mushroom. Happy two years! I found you last year when you did your amazingly helpful skirt series. As for the picture wow, that is a tough one. I am thinking maybe a cupcake with the brown part being a pleated cupcake liner? it's gotta be mushroom spores ! Still not sure what that is though. "Cry" I SO want to play along but I can not think of a single thing!!!! Congratulations though to your blog-birthday! Circus tent! I truly have no idea, but it was the first thing that popped into my head. Circus tent! I really have no idea, but that was the first thing that popped into my head. Hmmm, let me see..... a porcupine or hedgehog? My first thought was a sun but I don't know how that would work out plus the brown doesn't really make sense. Then I thought flower but again I don't know that it makes sense with the brown unless it is the center...I really like reading all the answers others have given though. Happy Blog Birthday Ikat Bag!! I think it's , umm , a turkey? I'm gonna say that's a sunflower of sorts. With the petals turned in. I don't really know. Happy blog birthday! Could it be the back side of a lion's mane? My first thought was a lion. My second thought was a wheel. But really, I think it is likely a mushroom like everyone else says. Happy 2 Ikatbag! I think it is the gills (underside) of a mushroom....right? Love your blog and I'm dying to make my own slopers! My first thought was cow (to match the chickens and the pigs) but I'm not sure what part of the cow... I'm guessing either a cow or horse tail. Not that exciting anymore. Anyway. I also thought that it reminds me of the underside of a mushroom. Am really curious what it is! Happy Birthday! I wish I could be completely brilliant and come up with the answer to this guess what. My guess is it's some sort of food: giant dumpling or a type of baked good? OK, this is hard. I think it looks like the bottom of a mushroom, but that can't be right. At first I thought it was a sun, but I really want it to be a farm animal to go with the chicken I've almost finished (still having some issues getting the egg tube to work, I think I need to shorten it, when it's done i'll post it to the flickr group) and am really enjoying making, so I'll guess that it's a turkey's tail. I've been puzzling over this since I first saw your blog yesterday. But I have no idea. :) Can't wait to see the answer! Sunflower? Black eyed susan? Some sort of summery flower like that... maybe in pillow form? Happy Birthday and thanks for the fun giveaway!